Hydroponics: For optimal results, mix ½ a teaspoon to 2 teaspoons of product per every 1 quart of water. of Humic Acid to the acre depending on soil conditions. Turf & Ornamentals: Initial application rate: 8 to 12 oz. Sq. Ft. Can be safely mixed with most fertilizers. part of regular fertilization program. Why plants love Fulvic Acid Hydroponics? For growth of a good healthy plant, one needs to provide them with proper nutrition. Different minerals and acids present in soil where the plant is grown continue to provide plants with nutrition. However, with time the nutrients of soils continue to decrease with constant consumption done by the plant. Thus to replenish soil minerals and acid levels one needs to provide soil with time to time acids like Fulvic Acid Hydroponics and other fertilizers etc. All of these products are easily available in the market. The Fulvic Acid Hydroponics is a type of acid product, which is manufactured from humic acid compounds. 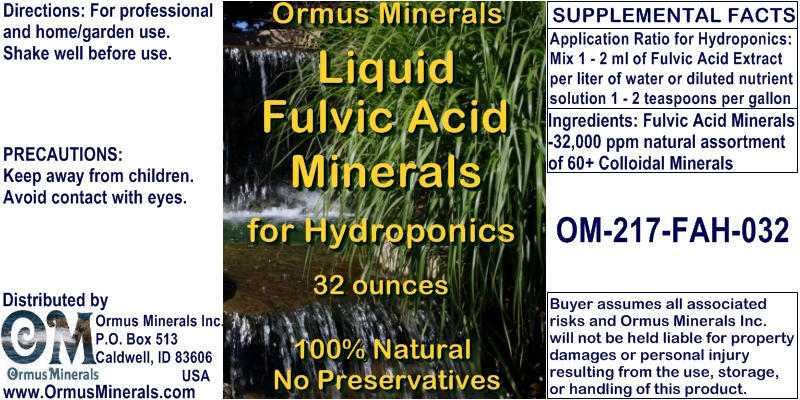 The major reason why fulvic acid is so helpful in plant growth is that the acid helps minerals present in the soil to dissolve. Thus, it leads to healthy growth of plants. For many years, fulvic acid has been used by people all over the world for growing plants with healthy roots and overall body. Another major use of Fulvic Acid Hydroponics is that it increases the metabolism rate in the soil thus it helps soil with increased respiration, which is also good for the plant. Moreover, increased metabolism releases proteins and with the help of acid, one can expect increased enzyme activity. The properties of fulvic acid help plant to absorb chemicals and nutrients from the soil at a good pace and as per requirement. Moreover, it provides plants with greater capacity to store more water as well as more nutrients required by the plant. The acid in comparison with any other acid is highly powerful. One molecule of fulvic acid consists of more than 60 minerals, which is a great benefit for healthy growth of plants. Moreover, the acid also increases the nutritive value of nutrients entering plant for quality growth. One of the most effective ways to use fulvic acid is to provide with this acid other fertilizers and minerals in the soil too. The nutrients and mineral obtained from the fertilizers will be stored and absorbed by soil and the plant. Thus, over time as minerals and nutrients of fertilizer in the soil get dry and mixed up using fulvic acid can help retrieve the entire stored minerals. Due to the fulvic acid, one can enjoy prolonged benefits of mixed fertilizer in the soil. The fulvic acid is low in molecular weight, which helps plants in added penetration. No matter what plant fulvic acid can enter plant cells and walls of cells easily. Moreover, the acid is also helpful in maintaining balance for deficiencies and efficiencies of the plant. The acid is good for usage in different plantation schemes. One can make use of fulvic acid for in home plantation. Moreover, one can also effectively use fulvic acid in the green house plantation. As per many agricultural scientists, there are many benefits of using fulvic acid. Moreover, it has resulted in increased production of crops in many places around the world. However, for effective usage of fulvic acid one must follow proper instructions as per particular soil type. Depending on the particular soil type, amount of mineral and nutrients present in it, weather and many other such factors is responsible for effective usage of Fulvic Acid Hydroponics. There are hardly any disadvantages of using fulvic acid or any other harmful effect.